...when you think you have a 10" springform pan in the house, and it turns out that you only have 9" and 8 1/2" springform pans, and you decide to go ahead and bake your hopefully delicious Passover orange-almond cake (to be drenched in an eye-poppingly intense mandarin-lime syrup) in the 9" pan. After all, what difference will one little inch make? A lot. And this picture was taken when it had already collapsed a bit. At its height, it was a good three inches above the pan. Fortunately it contained itself and the batter didn't run, and this cake is even now sitting in its bath of tangy citrus syrup, waiting for tonight's verdict. It did get this weird effect when it collapsed even more, as tortes are supposed to do -- the weirdness being that it developed a sort of a tight little waistline, like a pouffy dowager trying to cinch a belt in as far as it will go. Recipe (I added quite a bit of lime juice to the syrup, and some Boyajian orange oil as well) here. ...along with its companion, the Queen of Sheba, an aptly-named cake for the Passover table. I've made many a flourless or semi-flourless chocolate cake, but when I tasted this cake at Danielle's house a year or so ago, I knew I had to make it. It sat as an idea in my mind, waiting patiently for an occasion -- until now. 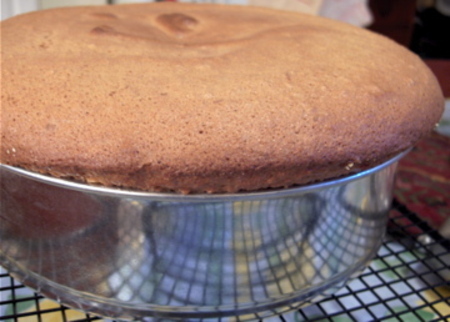 I did substitute Passover cake meal for the flour, which can sometimes be a dangerous thing. This happened to me a couple of years ago when I tried to make a tart crust for Thomas Keller's Lemon Sabayon Tart, using pine nuts and matzoh meal. Lemon sabayon filling? Great. Crust? Not so much. But when it's a matter of a couple of tablespoons, and most of the flour is nut meal anyway (I used ground hazelnuts instead of ground almonds), and there's a lot of good chocolate in it, which really hides a multitude of sins -- well, the Queen of Sheba should reign resplendent at the seder table tonight. 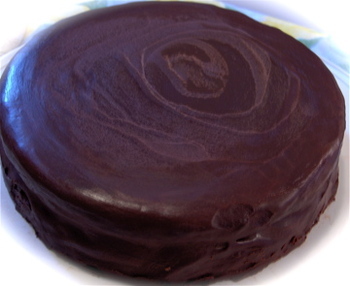 Of course, the ganache broke slightly, which accounts for the swirling techtonic effect on top. But I kind of liked it, so I decided not to have a fit and just get on with things. After several hours of hearing about the bread of affliction and eating a fair amount of matzoh, cake is always going to be a welcome diversion, even with a few imperfections. I was also hoping to make the much-lauded chocolate-covered caramelized matzoh crunch this year, but it simply wasn't destined to happen, since I was glazing cakes until rather late, which resulted in us having dinner at 10:30 last night. I will say that I have high hopes for both cakes, the Tamasin Day-Lewis recipe, slightly adapted by me, and the Alice Medrich/Habeas Brûlée version of the Queen of Sheba. Happy Passover. Update, 4/20/08: Both cakes were more than well worth making, and a big success with the Seder crowd. Orange-Almond cake was delightfully crunchy with a startlingly delicious citrus zing from all that soaking syrup. And the Queen of Sheba was sheer heaven. So much so that when the final episode of John Adams was about to start tonight and I realized that I didn't have any freshly whipped cream to go with the remainder of the chocolate cake to enhance my viewing pleasure, I tried to make whipped cream in the bedroom so I could watch TV while getting dessert ready (okay, restrain yourselves here). Yes, there were only slightly disastrous side effects before G and I were enjoyably transported back to the 19th century accompanied by plates of chocolate cake and whipped cream. Now see, if I had this kind of tidbit when I was growing up, I probably wouldn't have such trouble keeping passover. (I tried to keep it last year, this year I just gave up.) Instead I got craptacular over the counter macaroons, which ruined by idea of what macaroons were supposed to taste like until I order a sample plate of at Laduree. Oh how I long for a taste of this cake, imperfections and all. OMG the Queen of Sheba cake sounds heavenly, especially the framboise ganache. I'm bookmarking this one. I'm so glad you enjoyed the cake! Is the John Adams show as good as everyone says? I haven't seen it, but I'm told that I must. It seems to be so delicious. I want to try if I can. We also indicate home made foods in our website. Hey julie, I think you weren't at our wedding, were you? because the wedding cake was a combination of a reine de saba with the icing and filling from the Marquise au chocolat (orange brandy butter). That thing was incredible even a year later when we took out the top to finish it off. Oh, yeah, and I made the caramel matzoh crunch. You can find the recipe on epicurious by typing in the relevant words. Though I think smitten kitchen? has a variant that adds a tiny bit of salt. Mmmm, aimai, now I'm even sorrier that I missed your wedding than I was at the time...mmmm...reine de saba with orange brandy butter. Smitten Kitchen's link for the caramel matzoh crunch goes to same place my second link does, David Lebovitz, who is brilliant enough to add not only salt, but a bit of vanilla as well. I still haven't tried it, and absolutely must. Hey julie, I think you weren't at our wedding, were you? because the wedding cake was a combination of a reine de saba with the icing and filling from the Marquise au chocolat (orange brandy butter). That thing was incredible even a year later when we took out the top to finish it off. hehe nice post. hello friend thanks for share with us this amazing recipe I see it delicious!! Kitchen Disasters ... I see it delicious!! your blog is very interesting. the information it contains is very comprehensive and entertaining. I thank you for your help. Your food photos are amazing! I’ve been lurking on your blog for awhile and finally thought I’d say something…. your photography is excellent.